Even though Jeremy bought me that bamboo steamer to make dim sum, as I was researching options for gluten-free bao, I came across a recipe for steamed matcha cakes that set off a giant light bulb in my mind. 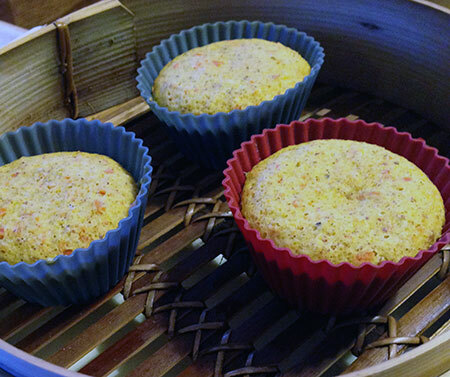 Ever since then, I have been on the track of using the steamer to cook muffins and rolls as a more traditional (and less damaging) alternative to fast-track baking than the microwave. Steam offers some real health benefits for baking. Not only does it allow some foods to cook faster than they would with dry heat in the oven, but the heat inside the steamer is maintained at the temperature of boiling water — which in my case, at an altitude of just over 6,000ft, is about 200F. This means that there is no chance that the starches in my muffins will produce acrylamide, a carcinogenic compound which can be formed when starchy foods are cooked at temperatures above 250F. It means that delicate essential fatty acids in the seeds are less likely to oxidize and form free radicals. And it also means that more temperature-sensitive nutrients are being preserved in the food after cooking. But what does steaming do to texture and appearance? 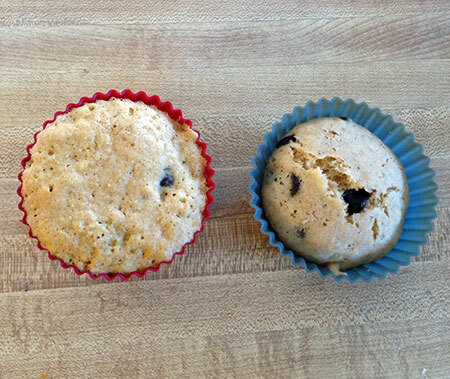 Microwaved peanut flour muffin at left, steamed muffin at right. Same batter, very different result. 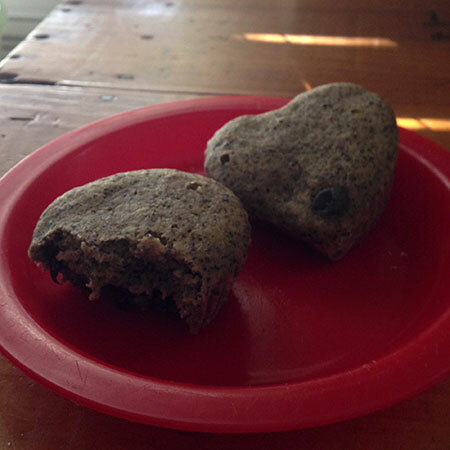 After the initial test case based on Jamie Oliver’s coconut buns, I tried steaming Nolan’s current favorite muffin recipe, grain-free peanut-based banana chocolate chip muffins. He was hungry so I baked three in the microwave as usual and did just one in the steamer, at a hard steam for 10 minutes. As you can see, the steamed muffin ended up with both a superior appearance and texture, and this is still my go-to recipe for a few quick breakfast muffins. 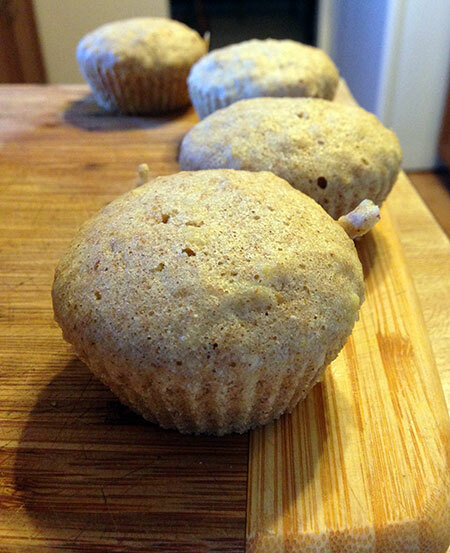 Steamed peanut flour muffins made with applesauce. Half the batter contained honey and chocolate chips, the other half molasses and cinnamon. I have also made variants using pumpkin puree in place of the banana, and a molasses spice version incorporating applesauce. Since then, I have been making at least one small batch of muffins every single day, tweaking the ingredients to use different fruit purees, different nuts and starches, and different flavorings. Not every batch is a success, but Nolan is still eating probably 80% of the varieties, so it has added a lot of sneaky nutrients into his diet. All are gluten-free, most are grain-free, some are paleo, and a few have attempted to limit potential allergens more fully. 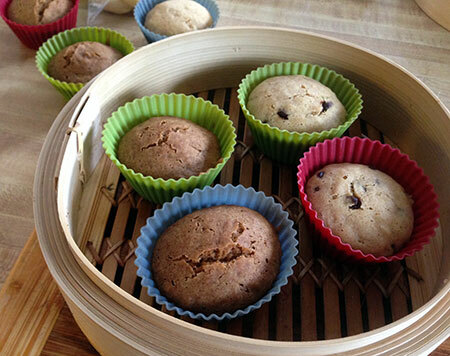 I have so many ideas that I am actually considering writing an e-book about steamed muffins! 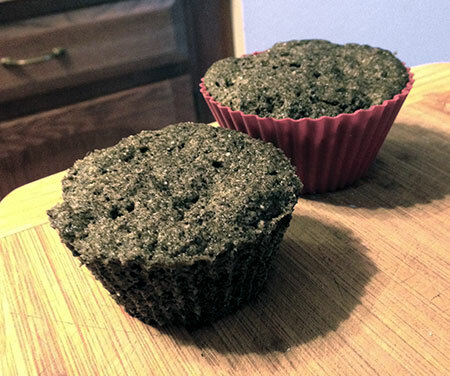 Here are just a few photos of some of the more successful muffin variants. I’m sure I’ll be posting more ideas and more recipes soon. 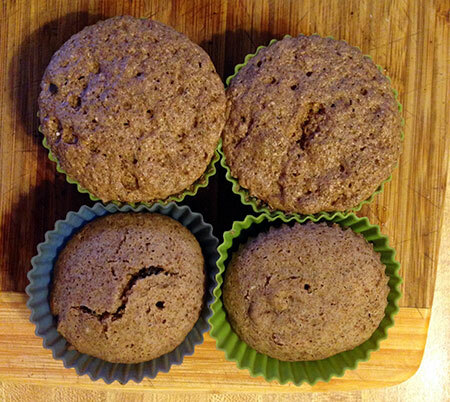 Almond butter muffins with adzuki bean paste and chocolate chips – microwave version in the top row, steamed version on the bottom. 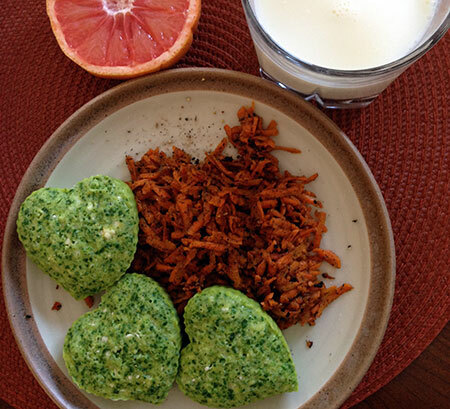 Spinach egg breakfast muffins with mozzarella and feta – these were basically steamed frittatas.